Those familiar with the French Wars of Religion might already be aware of the Amboise Conspiracy – a unsuccessful attempt by protestants to abduct the young King Francis II and seize power in 1560 – the aftermath of which was bloody even by 16th century standards. Indeed, the Chateau de Noizay is reputed to have been one of the strongholds of the protestant Huguenots during this brutal episode of French history. Of course, the atmosphere of this fine country house and its extensive grounds are more peaceful these days. And the ill-fated conspirators certainly didn’t have the luxury of tennis courts and a heated outdoor swimming pool. 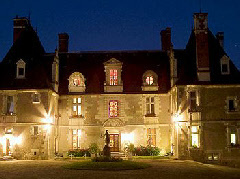 Accommodation is divided between the main building and the Pavilion de l’Horloge, with 19 guest rooms in total. The hotel also features its own restaurant.